Losing important files through erroneous deletion and other instances; like accidental formatting of device, corruption of a storage media, consequences of malware attacks and system failure, is an occurrence that we may encounter in our day-to-day life as we live in this digital time. Recovering these lost files may be tedious, time consuming, and sometimes disheartening when the lost file cannot be recovered. Hetman Software offers Hetman Partition Recovery Software to assist in recovering lost files quickly, easily, and safely. The following pictures will show you how to use the Hetman Partition Recovery and learn about the various functions of each button. When you launch the software, the first item that will pop up is the File Recovery Wizard. This will assist you as you proceed to the next steps in recovering your missing files. This tool is very helpful when you, as a beginner, are just starting to use the Hetman Partition Recovery software. Click “NEXT” button to start the process. You are given the option of choosing the disk where the missing file was initially located. “Mount Disk” – clicking this button will open a previously saved disk image and will be added to the list of options. 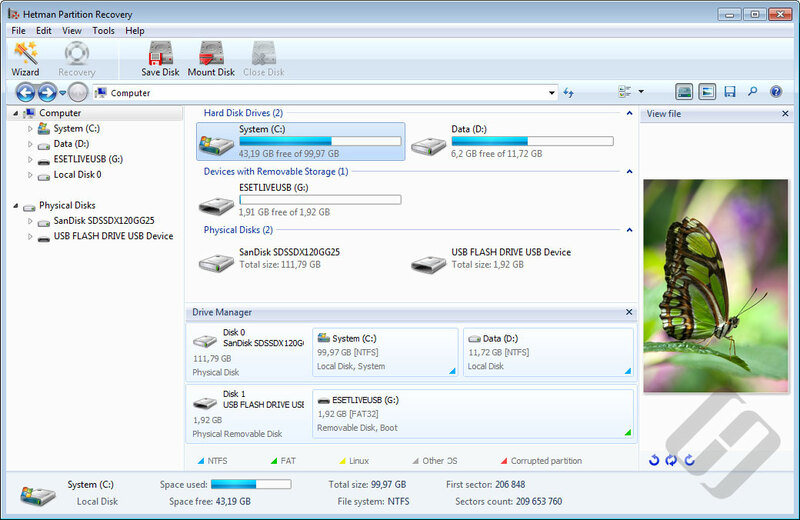 “Find Partition” – To locate files from the deleted partitions; just click on the physical disk which contained the partition and click “Find Partition”. The data found will also be added in the list of options of found disks. After choosing a disk, click “Next”. Fast Scan analysis is quick but will only restore recently deleted files from existing partitions. Full Analysis will conduct a thorough analysis on every sector of the selected disk. It will extract any viable information that has ever been stored in the medium. During analysis, the number of Drives found, Folders found, Files found, as well as the Time Elapsed and the Time Left is shown. Click “Finish” when the analysis is completed. After analysis, retrieved files and folders matching its original directory will be displayed. Deleted Folders and Files are marked with “X”. You can select the folders and files you want to recover. When you select a folder or a file, you can preview it on the right side of the tool. A recovery list is also located on the right side of the tool below the preview section. After selecting and previewing the folders and files, click “Recover” button to start the recovering process. There are four (4) options on saving the recovered data. First, Save to Hard disk. Make sure that the recovered data is stored to another hard disk. A prompt will appear if you try to save the data on the same hard disk it was recovered. This is to avoid overwrite. Insert a blank disk or a rewriteable disk on the disk drive and select a drive and click “Next” to continue. If a rewriteable disk already has saved data, click “Erase Disk” to delete its contents then proceed to the next step. After specifying the Disk Label, Burn Speed, and File System in the Burn Options click “Next” and select the recovered files to be burned and click “Burn”. Third, Create ISO Virtual Image. In this option, you must specify the name and location of the ISO File, disk name or label, and file system. Click “Next” then select the files you wish to recover and click “Create” to start the creation of the virtual image. This option is used when the recovered files requires more than the available storage space. Specify the necessary option in saving your file like Restore Folders Structure. Next, choose the files you wish to recover. Input the necessary setting for your FTP server. Then, click “Next” to select the remote location to store your recovered data. Click “Save” to start the upload. Your data recovery process is done once the recovered files are saved and you can view these files at your discretion. As what Hetman Software promised, using Hetman Partition Recovery makes data recovery quick, easy, and safe.